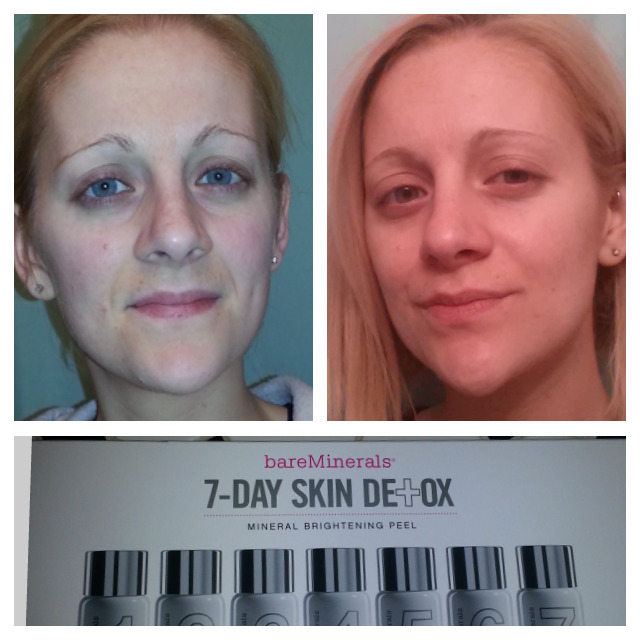 Ok, so as I mentioned on a previous post, I've been trying the Bare Minerals 7- Day Detox. Here are my results! First off, the process itself was really really easy. Like stupidly easy to follow the steps. There is one vial a day along with a big cotton pad in which to pour the vial. Anyway, the biggest concern with this among some co-workers was that issue of this irritating sensitive skin. I consider myself to have semi sensitive skin. I can only use certain products and nearly all foundation makes me break out sans Bare and maybe one or two other. So, this product did not irritate my skin. The ugly part of this is that each step burned when I applied it. Not to the point that I needed to wash it off, but it was a little irritating and slightly painful each time I put put on a step. The up side is that I think I have relatively decent skin to begin with, so I don't think I absolutely needed this, but overall I think my skin was insanely softer at the end. I did notice the pores and acne scars on my cheeks and nose were slightly diminished. Only by a teeny bit on the latter. I've never had a facial before, but I think all things considered I'd do this facial again before I went to a salon for one. I am happy with the results, especially by how moisturized and supple my skin feels now. I know my before and after photos are not that amazing, but I do feel a difference! This product can be found at Bare Minerals for $75.